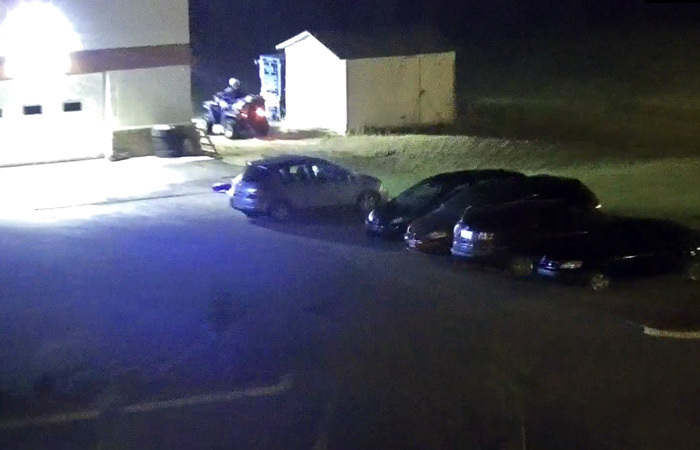 Suspect caught on camera at Southland Church property in Steinbach, MB. Steinbach RCMP are currently investigating a recent theft incident where a shed was broken into on the property of Southland Church in Steinbach, Manitoba. Police say that on August 6, 2018 at about 4:15am, an individual broke into a storage shed that was located on Southland Church property. The Church is located on Highway 52 W in Steinbach. Police say that the suspect, driving a blue quad ATV, left with a small trailer, generator, water pump and some gas and oil. RCMP report that Southland Church has ramped up their security presence on their property since this incident occurred. Steinbach RCMP are asking the public for assistance in identifying the individual or quad. If you have any information in regards to this incident, you are asked to contact the Steinbach RCMP Detachment at 204-326-4452 or CrimeStoppers at 1-800-222-8477. You can also submit a tip online at www.manitobacrimestoppers.com or text TIPMAN plus your message to CRIMES(274637).